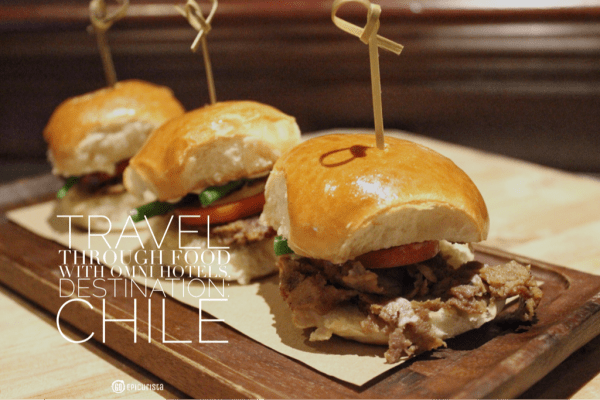 Travel Through Food with Omni Hotels: Destination Chile! #TasteChile with Omni Hotels and Wines of Chile “Flavors of the World” promotion! If a trip to South America this time of year sounds deliciously tempting yet physically impossible, worry not. The talented culinary team at Omni Hotels & Resorts has brought the rustic flavors of Chile to Orlando, and other Omni properties around the country, during their “Flavors of the World” promotion, now through December 31, 2015. Each year, Omni Resorts’ Food & Beverage teams travel to a select destination for a cultural immersion to explore the flavors of the region in order to create a menu full of authenticity and charm to share with guests. In its ninth year, “Flavors of the World” shines the spotlight on the vibrant South American destination of Chile. Omni Orlando at Champions Gate Food & Beverage Director Tobias Cox tried his best to convince us the trip was hard work. Touring vineyards along the Colchagua Valley, and tasting the indigenous foods and drinks, all sounded like an absolute dream for the food enthusiasts in attendance at a recent media dinner. Not even his mention of colored spiders found in the vineyards could have changed our minds. More on that later, but needless to say, we all wished we had been invited along on the trip. I believe when physical travel is not possible, the next best thing is to travel through food, and that is exactly what we did with Executive Chef Robert Ash serving as our expert tour guide. My good friend X and I often dream about a trip to her home country of Chile to explore the vineyards, the beautiful landscape and, of course, the food. She was the perfect dinner date and “authenticity consultant”. As each dish was served, I looked to X for a nod of approval. Needless to say, she practically nodded her head off the entire night. I was pleasantly surprised the dishes were not only fantastic in flavor and presentation, but also in tribute to the Chilean culture. Our tasting journey began with Chile’s national cocktail, Pisco Sour, made with Capel Premium Pisco. This double-distilled brandy made of Muscat, Pedro-Jimenez and Torrontes grapes grown in the Andes mountains, is known as a national treasure. Pisco often elicits proud (and mostly friendly) arguments amongst Peruvians and Chileans over who invented it first. The refreshing cocktail made with fresh lemon juice and sugar was given a colorful twist with a splash of pomegranate syrup. Pisco Sours are popular across the country right now. Expect to see more bars around town serving this fantastic cocktail, especially in our warm weather. We noshed on these nibbles with our pisco sours during the pre-dinner cocktail time and found the filling bites to be a perfect match with the powerful Pisco Sour. They don’t call it “fire water” for nothing! Those cocktails pack a dangerous punch as they are so easy to drink. Pebre, meaning pepper in Catalan, is the Chilean version of salsa using aji peppers as the primary ingredient. It is one of the most common condiments on a Chilean table. It can also be made with tomatoes or avocado – known as ‘palta’. This chunky yet creamy version of guacamole with tomatoes and banana peppers added a nice contrast to the crunchy potato cake. 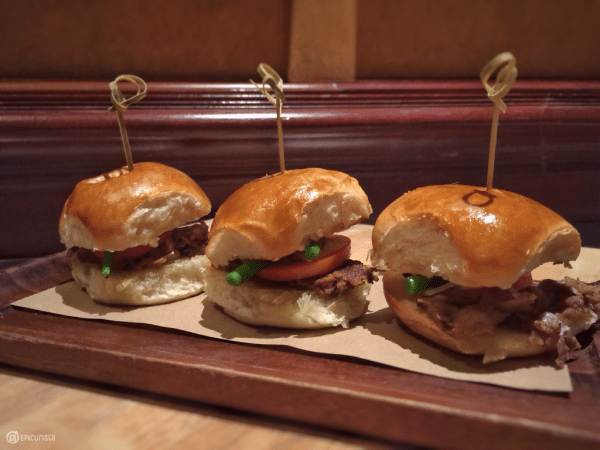 The Omni chefs transformed the traditional Chilean sandwich, Chacarero, into mini sliders for a plentiful appetizer made with beef steak, crisp green beans, tomato and banana pepper. Who knew green beans in a sandwich would be so delicious? They added a nice crunch and contrast to the tender prime rib with the banana pepper giving a touch of sweet heat. Dinner began with a soup course and everyone was instantly quiet at the table. Always a good sign. 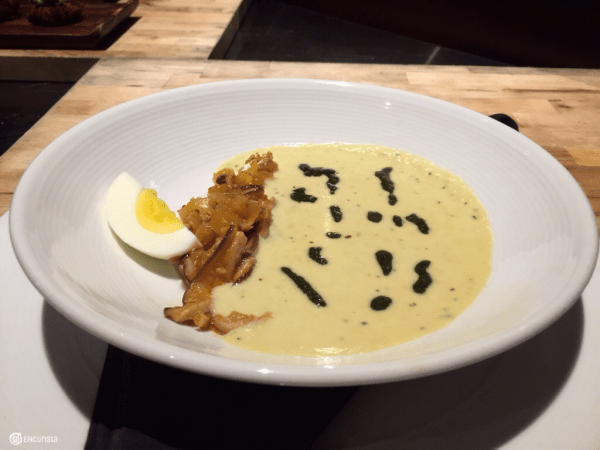 Corn – choclo – is a rustic staple of Chilean cuisine and this soup showcased it beautifully using local Zellwood corn. Blended with mushrooms and acorn squash for a rich texture and depth of flavors and garnished with a hard-cooked egg and basil. Everyone practically licked their plates. I can only imagine enjoying this soup after a chilly day skiing on the slopes of the majestic Andes. 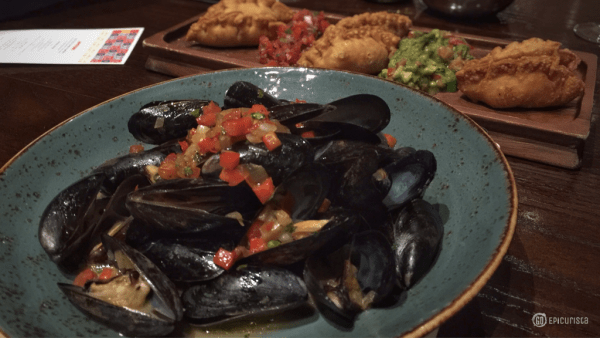 Platters of Empanadas and succulent Mussels followed. Sparkling wine contributed to the lively conversation as we listened to stories from Mr. Cox’s visit to the Cono Sur vineyards, a leader in sustainable and organic winemaking in Chile. These hand pies with a variety of fillings are a staple of Latin American cuisine. My friend X’s mom makes the best empanadas, served by the dozens at their family feasts. For fear of not being invited back, I cannot disclose how many of these I devoured during their “Fiestas Patrias” national independence celebration. Let’s just say I ate my share, and then some. 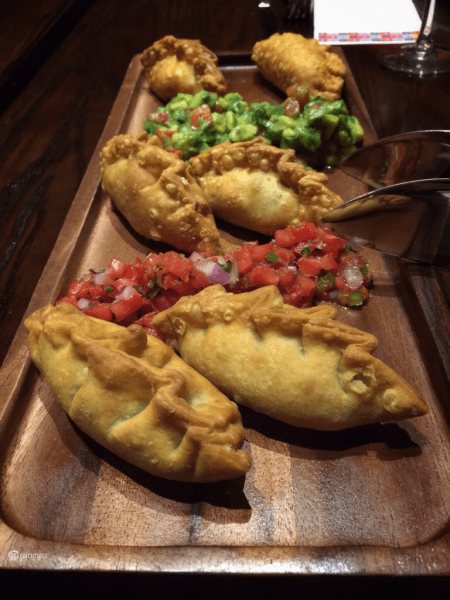 When these gorgeous looking platters of empanadas arrived at the table we both knew the Omni had big shoes to fill. We sampled three varieties – Beef, Shrimp and Cheese and Onion – and all got the thumbs up. The dough was perfectly baked, golden brown and crisp on the outside yet slightly doughy and chewy soft on the inside. 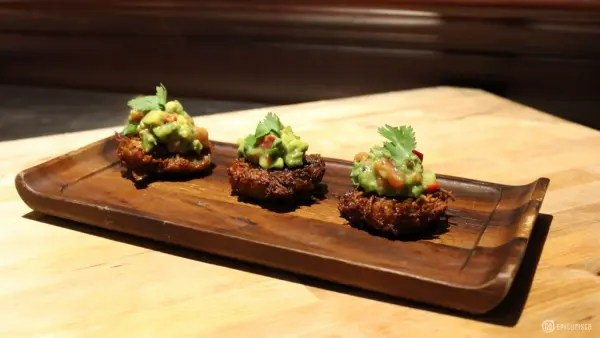 The fillings were flavorful and plenty and the accompanying pebre of tomato and avocado provided a nice freshness to each one, although you would easily enjoy them without it. ^ “Pino” filled with shredded short rib, onions, hard cooked eggs and green olives, given a sweet savory quality by the addition of golden raisins which was quite enjoyable. These brought back wonderful flavor memories of my grandmother’s signature pastelitos (a round version of an empanada). ^ “Camaron Queso” filled with prawns, three cheeses including cream cheese and Parmesan and spring onion, these were a real treat. ^ “Pequen”, the traditional Chilean empanada, filled with caramelized onions flavored with four types of chiles and Merquen, a traditional Chile spice. It was like a decadent French Onion Soup transformed into a doughy pastry. A favorite of the night, steamed mussels in a flavorful broth with tomato, onion, bell pepper and cilantro. The entrees offered something for everyone. The pescatarian, the vegetarian and the meat lovers all had something to rave about. Not the typical “Chilean Sea Bass” i.e. Patagonian toothfish, as you’d expect, but rather cod similar to striped bass, perfectly seared. 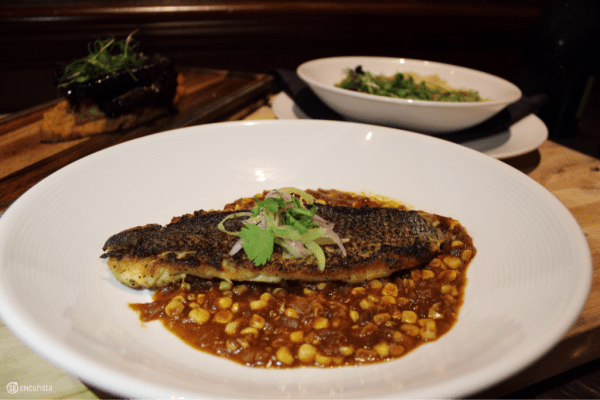 Braised tomato, sweet Zellwood yellow corn and cilantro salad served as a great accompaniment for this homerun of an entrée. The flavors all blended together brilliantly. Pork ribs slowly cooked in beer and palm honey, which made them indulgently sticky and messy to eat – as all BBQ ribs should be. 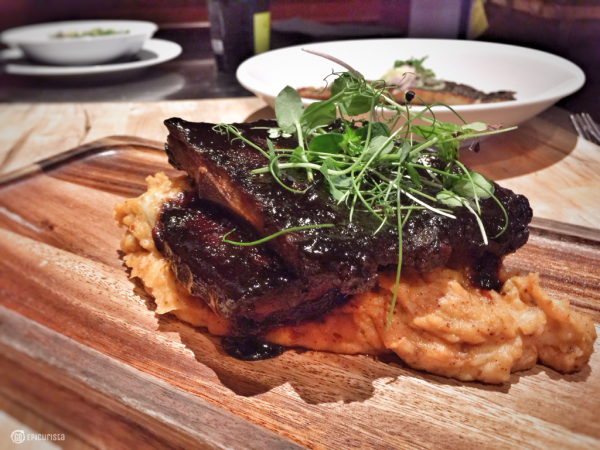 Served with potato puree flavored with Chilean smoked chili pepper. 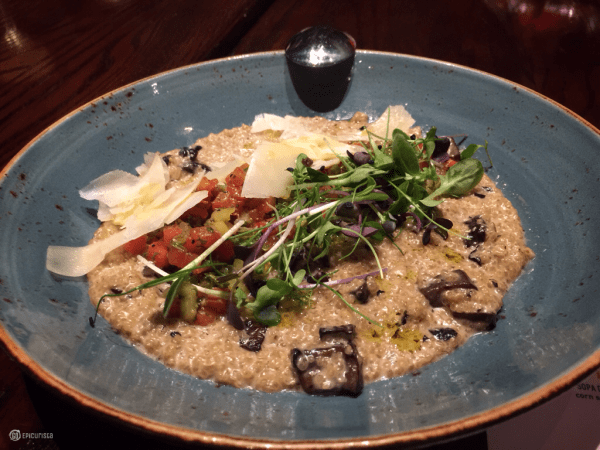 A dish which satisfied vegetarians and non-vegetarians alike, the golden Chilean quinoa slowly cooked as a risotto with roasted mushrooms and avocado was rich and decadent, without any guilt. By the time sweets arrived, it is safe to say we were pleasantly stuffed. Thankfully these offered the opportunity to have a few bites to end the evening on a sweet note without the need to over-indulge. 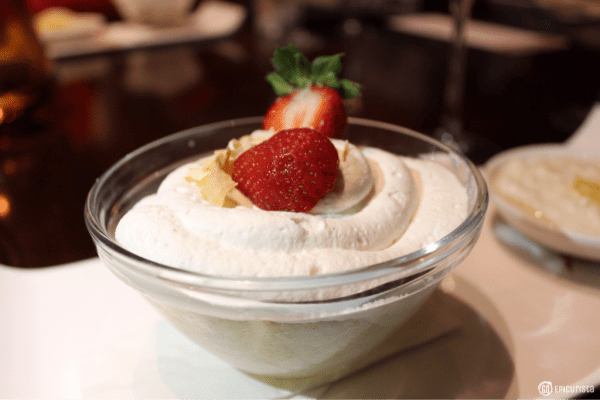 Sponge cake soaked with three milks – whole milk, evaporated and condensed – topped with whipped cream and fresh strawberries. 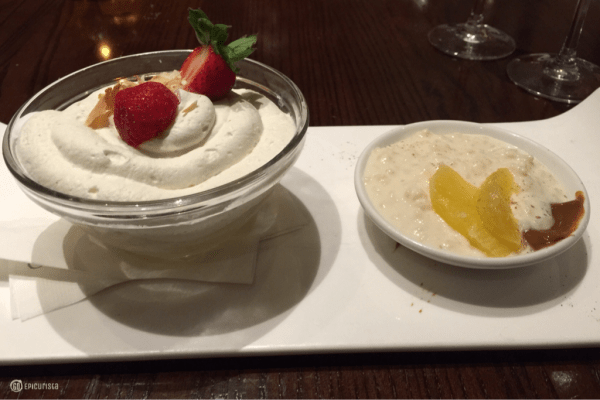 The dessert was lighter and not as sweet as traditional Tres Leches, which tends to be quite rich. After the meal we had, this was a good thing. 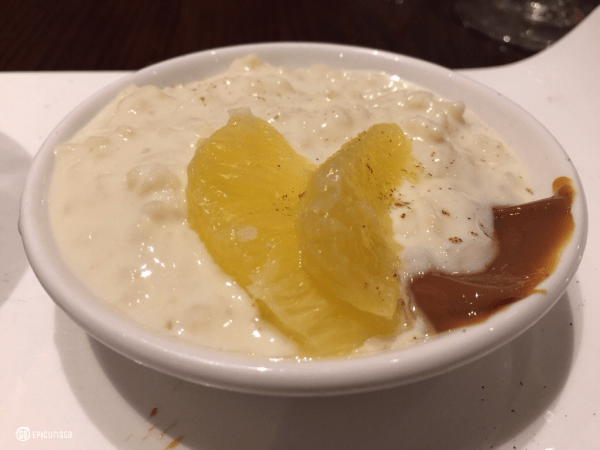 A traditional comfort food treat in Latin American homes, the Arroz con Leche, made with short grain rice cooked with milk and cinnamon was given a Florida citrus twist with fresh oranges and a dollop of dulce de leche – or Manjar as this thick caramel paste is called in Chile. Although X., my authenticity checker, did not give this one a thumbs-up, I enjoyed the creamy texture and touch of citrus, and of course anything with dulce de leche is worth the calories. Did I say earlier we didn’t over-indulge in desserts? Who am I kidding? A Chilean dessert I hoped to see on this menu was Milhojas Cake, made of layers upon layers of puff pastry with dulce de leche sandwiched in between, it is one of my favorites. You can read why in this post. Imagine the Atacama Desert to the north, the Andes Mountains to the east, the Patagonian ice fields to the south and the Pacific Ocean to the west. Picture yourself in this gorgeous winemaking paradise, tasting everything from sparkling brut, viognier, Sauvignon blanc and chardonnay, to Cabernet Sauvignon, syrah, Pinot noir and the national varietal, only found in Chile, Carmenere. Chilean wines are some of the most versatile and easy to pair with food, plus they offer great quality and value. Next time you’re in the wine store, pick up a few bottles. Certain to stand up to more expensive versions from Napa and Bordeaux. 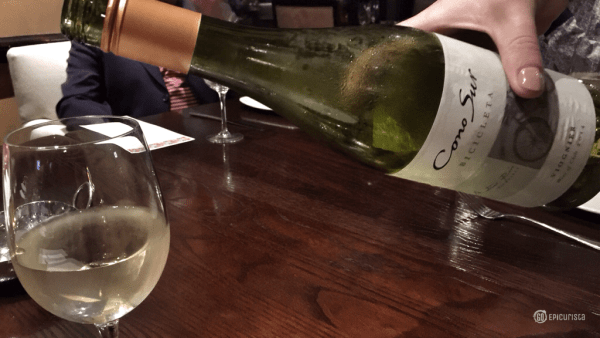 Cesar Matus, Omni Orlando’s Director of Food and Beverage Outlets, introduced us to three beautifully paired selections, from the eleven wines featured in partnership with Wines of Chile. Vina Cono Sur Brut from Bio Bio Valley was crisp and bright with notes of green Granny Smith apples. You can never go wrong with bubbles, especially during this festive time of year. A versatile wine which pairs with everything on the menu, Vina Cono Sur is one of the few wine producers in Chile making sparkling brut of this quality. Vina Cono Sur Viognier “Bicicleta” from Colchagua Valley, Central Valley was aromatic with great structure to stand up to the varied flavors of the Chilean dishes. This winery has been a leader in sustainable Chilean winemaking, even using red and white spiders as part of its pest control practices. We learned the red spiders take care of pests, while the white spiders take care of the red spiders and then die off. A perfect circle of life allowing winemakers to avoid use of chemicals for pest control. A fact which was both fascinating and intimidating for those of us with arachnophobia. I will say, spiders won’t keep me from visiting Cono Sur when we travel to Chile. I wonder if riding bicycles around the vineyard is allowed? 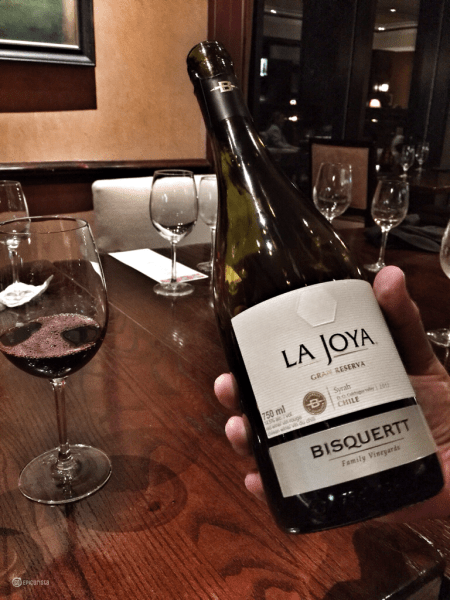 Bisquert La Joya Syrah “Gran Reserva” from Colchagua Valley, Central Valley was elegantly inky with lots of black and red ripe fruit and balanced earthiness. I could have enjoyed this wine all night, lingering on every flavorful sip with dreams of travel to Chile on my mind. It was a nice pairing with all the entrees sampled. 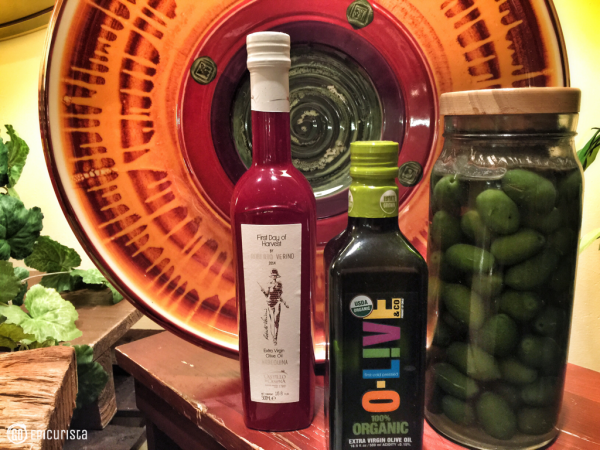 Further showcasing the Chilean product, Omni Hotels will feature premium Chilean olive oil at every table. It’s good for you. If Chile is on your Travel “Someday List”, check out ProChile and start planning your trip. 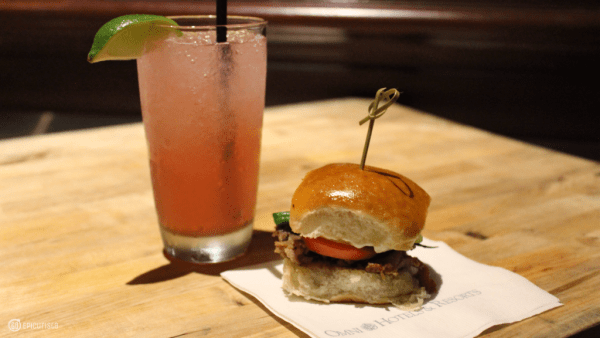 While you do, stop by Omni Resorts for inspiration and to indulge your foodie wanderlust until you can #MakeSomedayHappen. 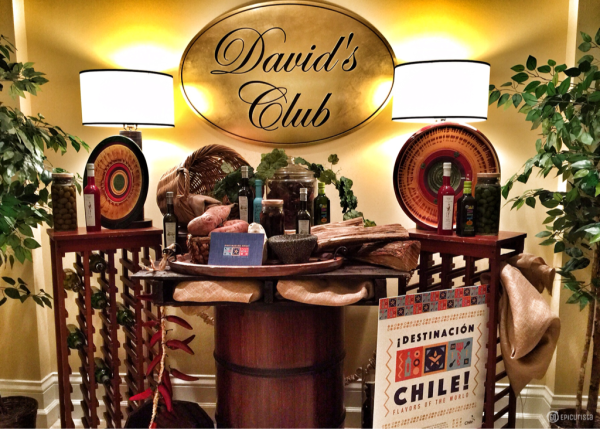 The Destinacion Chile Flavors of the World menu is available at the upscale David’s Club. Reserve your table and I promise your taste buds will thank you for taking them on this fantastic South American culinary journey. Disclosure: We were invited guests of Omni Orlando Resort at Champions Gate for this media dinner. No other form of compensation was received. Opinions are my own, and as always, I only share with you culinary experiences worth celebrating.